That lovely salty, fatty, umami-filled, thin-sliced, beautiful morsel of food. Nothing is quite like it, whether wrapped around a slice of melon, some grilled asparagus, placed on top of a wood-fired pizza, or just eaten on its own. So what is it? Prosciutto has its origins in that wonderful motivator: necessity, and dates back to pre-refrigeration days. When a whole pig was slaughtered, all of it couldn't be consumed before it spoiled. The early cooks discovered that by completely surrounding the meat in a salt and sugar mixture, then hanging it to dry, the meat remained good to eat. Prosciutto di Parma dates as far back as Roman times! All of this is great if you dig on swine, but if you don't eat pork then this delicacy is lost to you. Enter duck breasts. They have a thick layer of fat on them, similar to the fat on the outer layers of a ham. Under that fat is a beautiful layer of meat just dying to be cured. And that’s what we do here at The Spatula. 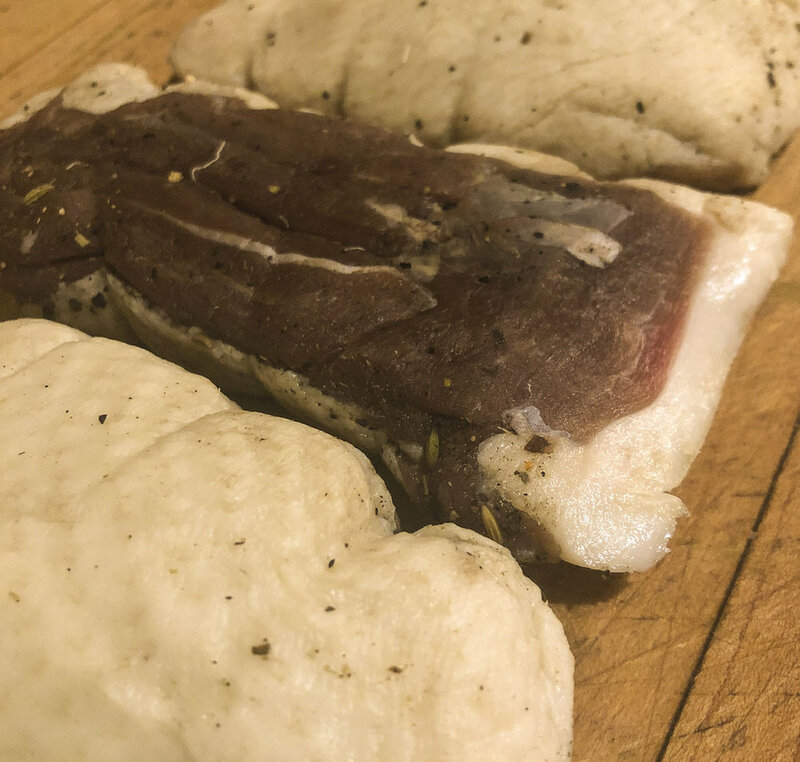 The first step: choose the spices that will flavour the duck breast while it sits in the curing process. As we are replicating traditional prosciutto we use the same spices: juniper berries, fennel seed, peppercorns, bay leaves and star anise. We toast them lightly in a dry pan to release their oils, intensifying their flavour. Then we grind all the spices together and when cool add to a salt and sugar blend. The salt is what actively cures the meat by drawing out its natural moisture. As the moisture comes out, the spice flavour goes in. It is really incredible. The breasts sit in the cure for three days. We rinse off the cure with white wine, pat dry, wrap in cheesecloth, and hang in the fridge for three weeks. Finally! They are ready for cutting. Come try some of this delicious salty snack on top of our duck prosciutto burger, topped with the prosciutto, arugula, apple butter and smoked cheddar! What could be better than a juicy beef burger seared to perfection and topped as you like it? At the diner we believe good food need not be complicated. Our trained chefs start with 100% fresh, never-frozen beef and add a simple blend of spices. We hand blend the mixture, weigh each patty to 6 ounces, then hand press this tasty beef and spices mixture into patties. Your burger starts off seared on the flat top, heated to 480 deg F, while weighted. The weight ensures that the meat is firmly in touch with the cooking surface, giving the patty a beautiful sear and even cooking. As the burger cooks we spread our sesame seed bun with garlic butter then toast it on the flat top. We top your burger with a hybrid lettuce designed specifically for burgers: this blend has iceberg for crunch and leaf lettuce for the beautiful curls at the edge. Next is a plump slice of tomato, a garlic pickle, and red onions. That’s what goes on our Classic burger, check out the list of additional toppings to truly customize your burger. Accompanying our burgers are fresh hand-cut fries that we blanch daily. If you’d rather, go for sweet potato fries, onion rings, poutine, garden salad or caesar salad.